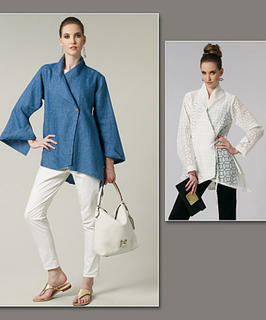 New Zealand's leading supplier of sewing patterns for tops, vests & jackets. 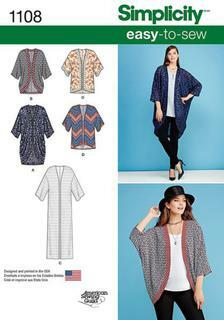 Misses' knit tops feature draped faux wrap on front of views C & D, along with contrast yoke. Views A & B feature draped faux wrap back with option of short or 3/4 sleeve. Simplicity sewing pattern. Misses' knit sportswear pattern features a ponte moto style jacket with leather or faux leather front panel, long sleeve top in hip or cropped length, and slim skirt and pants. Sew Stylish Collection. Misses and plus size Easy-to-Sew knit sportswear pattern features boxy top with column sleeves, square shaped vest, slim pants and knee length pencil skirt. Simplicity sewing pattern. Misses' Easy to Sew knit pants, skirt and top. Dress up a simple sweatshirt with contrasting fabric in sequins or add jewels or studs. Pair this top with a simple knit skirt or pants for a casual everyday office look. Misses' Tops with Fabric Variations Misses' tops feature creative fabric mixing to get unique daytime looks. Views A & B feature a contrast back inset, and C & D feature back with cut out, and contrast fabrics. Misses' Tops with Fabric Variations Misses' high low tops can be made with several variations including sleeveless with or without side & back contrast, short contrast sleeves or half sleeves with front lace overlay. Misses' Kimono's in Different Styles Misses' kimono pattern features styles for every occasion. Pattern includes draped kimono in short, or long with contrast bands, stright floor length kimono, and short kimono with or without trim. Misses' Top, Pants or Shorts and Skirt Misses' Easy-to-Sew sportswear pattern includes top, pull on pants, shorts, high-low skirt and a tie belt. Make top and bottom pieces in matching fabric for a modern faux jumpsuit look. Simplicity sewing pattern. Misses' Easy-To-Sew Knit Tops Misses Easy knit tops can be sleeveless with sheer inset band and optional trim, or sleeveless with trim straps in back and option of contrast band. Top can also be short sleeve with option of contrast band and sleeves. Mimi G. sportswear pattern for miss includes great jacket, slim trousers or shorts with fly front and carriers in stretch wovens, and knit tank top. Mimi G. for Simplicity. Misses' V-neck knit top has sleeve variations, optional contrast yoke and panel with asymmetric hemlines. The scoop neck knit top has sleeve options and a beautifully draped hemline. Simplicity easy-to-sew pattern. Miss and plus knit tops include top featuring contrast side panels with flutter or three quarter sleeves, cap sleeve or sleeveless top with double layer and back interest, or sleeveless top with stretch lace hem. 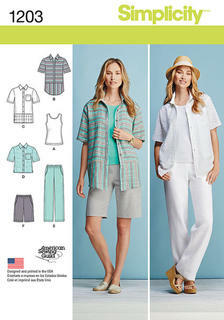 Misses' and miss plus sportswear pattern includes short sleeve button down with or without contrast lower band in two shapes, knit tank top, shorts and pants with elastic waist and pockets. American Sewing Guild.